Few names are as synonymous with animal conservation as Jack Hanna. Through his Emmy-winning TV shows—“Jack Hanna’s Animal Adventures,” “Jack Hanna’s Wild Countdown” and the Emmy Award-winning “Jack Hanna’s Into the Wild”—and he has helped generations nurture their appreciation of wild animals and the shrinking world in which they live. Perhaps best known for his late-night TV spots, Hanna is the longest-running guest on shows hosted by David Letterman, dating back to 1985. Regardless of the venue, he has used each appearance to introduce the world to exotic animals and raise awareness of the issues threatening their long-term survival. 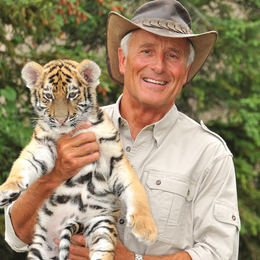 He will bring his message to the Keswick Theatre in Glenside on January 31, when he will do two performances of “Jack Hanna’s Into the Wild Live.” With each performance, the man who has earned the nickname “Jungle Jack” will share stories and exclusive footage from his global adventures and, of course, introduce audience members to some truly spectacular animals. He travels for as many as 80 shows per year, all while holding down his day job as director emeritus of the Columbus Zoo and Aquarium in Columbus, Ohio. We caught up with Hanna in Columbus, where he spoke about the importance of conservation, the unpredictability of wild animals and which beast he would come back as, if given the chance. What do you see as the most pressing issue as it relates to animal conservation? The main thing is overpopulation. … When I was young the world seemed unlimited, but when you travel and see the world, you begin to realize that it’s a small place, and it can’t take it. You see starvation, poaching and other things that shouldn’t have to happen. We were given this planet to take care of, but there are only so many people it can accommodate. I don’t think we’ll ever get ahead of it, but it’s up to us to change it. How has the role of the zoo changed, if at all? There was a time when a zoo in America wasn’t a good place to be, but today that’s not the case. I wish I could come back as one of our animals. Ninety-five percent of animals in zoos come from other zoos, not from the wild. A zoo’s first priority is education, and without education there can’t be conservation. If you can’t teach people to love these animals, then they can’t be saved. I wish everyone could get to see the places I get to go to, but that’s not possible. Last year American zoos gave $42 million to conservation projects; Columbus Zoo alone gave over $2 million to the wild. Some groups will say, “Put them all back in the wild.” I’ve seen more animals in the wild than anyone else in the world, and I would like to see everything back in the wild, but that could never happen in the world today. What’s the wild? The wild is the South Pole, the North Pole, the Congo in Africa and the Amazon. The rest is taken. I remember a few of your TV appearances where an animal of yours was having a bad day. Is there one moment in particular that was scary or unexpected for you? I was bitten by beaver in ’86. He had these nice big teeth, and he got me right in the palm of my hand; it was a mess. Then there was the ostrich that had diarrhea on Letterman’s show, and I guess that one was funny. Then there was the time I was bitten when I was helping a guy in Florida move a 17-foot anaconda. Anacondas aren’t venomous; they’re constrictors, and they have about 200 teeth and the ability to make their jaw muscles lock. After about 30-something minutes, I was able to get free, but I almost lost two fingers. You don’t brag about those things. I always say that if we get injured while interacting with an animal, 98 percent of the time it’s our fault, not the animal’s. There has to be a comfort zone for the animal, and there has to be a comfort zone for us, and it’s a train wreck when you don’t have one. You can dive with great white sharks and tiger sharks and bring them into your world, but you have to do it in a respectful way. I always say you have to touch the heart to teach the mind. I would say elephants are fascinating, and I think they surpass primates for intelligence. You’ve got gorillas, big cats, snakes—cobras especially—leafcutter ants … all of them I think are fascinating. I still get chills when I see a bald eagle, and even when I see a deer in the backyard. I get excited about everything. If you were to ask me what animal I would want to come back as, then I would say a hippopotamus. A hippo gets as fat as he wants, and he stays in the water 20 hours a day; he even breeds in the water. All that time in the sun and the water, I’d like that life.